and it's benefits for your cat's health! Cat Massage has become very popular with cat owners. Some feline therapists conduct classes designed to teach owners how to massage their pets, others will come to your home and perform the service themselves. Massage is a natural way for cat and owner to bond and a great way to decrease physical and mental issues that cats may have, such as nervousness and aggression. Regular, daily massage also helps the owner to detect problems such as weight gain, lumps or bumps, unusual hair loss or any type of skin issues. Feline massage can reduce stress and blood pressure levels in your cat as well as increase the cat's blood circulation. It can also reduce swelling and fluid retention, if performed carefully and properly. Massage may also improve socialization in cats. It is a great way to reward a cat that has had a veterinary visit or a stressful cat show. You have to know what is normal in order to detect what isn't. Most cats have harmless bumps and scars. Once you know the feel of your cat's skin you will quickly recognize something different. You can also feel any flea issues or skin conditions by massaging on a regular basis. Be careful to not squeeze or add uncomfortable pressure, this will only make him/her more tense, and defeat the entire bonding experience. You will easily be able to tell if your cat is gaining or losing weight, and if the skin and fur is healthy. Usually, these are signs of injury or illness. Animal massage techniques can help you learn if the injury or illness is getting worse or progressing faster than expected, staying the same or getting better. A cat's glands are located below the jaw, above the shoulder blades, at the armpit, and the groin area. Be extremely gentle massaging these areas, as they are sensitive to the cat. This should be done very gently. Do not add pressure or squeeze -you could really hurt your cat. 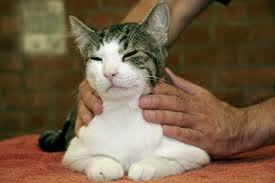 If your cat tenses or if you feel it is uncomfortable in any way, do not continue the massage. Start the massage petting the cat the way you normally do, long flowing strokes on it's back is great. Feel the fur's condition and notice any areas that feel sparse. After a few minutes, press the tips of your fingers more closely to the skin to detect any unusual problems. You may then want to move to the ears, neck and back, using gentle, circular motions. Spend extra time around the ears, cats usually love that area rubbed. Massage each leg gently, including paws and pads. Slowly move to the chest and massage for a few seconds. End with light, gentle belly massage. Sometimes cats do not care for the belly massage so be sure to stop if your cat begins to fidget or protest in any way. This DVD, Cat Massage is a great way to learn how to massage your cat. It provides easy step-by-step instructions with tips on cautions and how to know you are truly helping your cat, and not hurting. Cats tend to age well and can live to be 20 or more. However, as cats begin to grow old (after age 10), they experience pain with tooth decay, lack of flexibility, loss of hearing and vision, and nail decay. These changes can cause fear and anxiety. Massage can help relieve the anxiety and increase blood circulation to stiff, sore muscles. It's also very relaxing. Acupressure is also great for your cat's health and well-being. It is a concentration of light, fingertip pressure on certain areas of the cat's body, improving the flow of Chi (life energy in Asian cultures) and adding vital oxygen support to the cat's organ systems. Always consult your veterinarian to make sure cat massage or acupressure is safe for your pet, especially if they have been trough a recent traumatic event.